King Alfred Leisure Centre in Hove had to be closed this morning after storm Imogen damaged the roof. Parts of the Promenade have also been cordoned off. Residents are being asked to stay away from the immediate area. Marino Zanti, general manager of The Needles Landmark Attraction, said that the storm was almost as bad as the one in 1987. A woman has been injured by a falling tree in Shoreham. The woman was unpacking her car in Connaught Avenue when the tree was blown over by the wind. Neighbour David Illman said the woman was taken to hospital suffering from a head wound. The fallen tree damaged another neighbour's car. 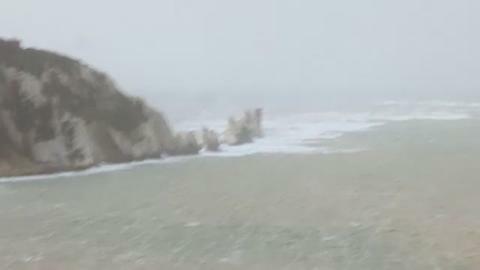 Mark Cole filmed this footage of Storm Imogen hitting Stokes Bay in Gosport. This incident happened on the A21 not far from Claremont School in East Sussex. The driver was left shaken by the incident. Storm Imogen is continuing to cause disruption in the South. Drivers are being urged to check the weather and driving conditions before setting out. They are being asked to pay particular attention to exposed locations such as coastal and high-lying areas, and bridges which could be affected by the high winds. A badger had a lucky escape when it was nearly hit by a flying object during the weekend's storm. As Storm Imogen started to take hold on Saturday night, the badger had a close shave in Ashford in Kent. Wildlife enthusiast Angie Davidson's night vision camera filmed the badger eating peanuts in her garden. It narrowly misses getting hit by the top of a large vegetable planter after it blew loose in the wind and toppled over. The poor badger was startled and ran off. However, it did return later to finish its snack.